Thomas Moody, 45, had just recently been made a Captain. This 18-year FDNY veteran came from a family of firefighters: a father, uncle and both brothers were in the FDNY. He had been assigned desk duty for several months, developing a course to teach hazardous materials handling. With a degree in chemical engineering, that was his specialty. On 9/11, he was filling in at Haz-Mat for some firefighters who were taking required physicals. Moody had four children: 12, 11, 8 and 6. He died in the North Tower. 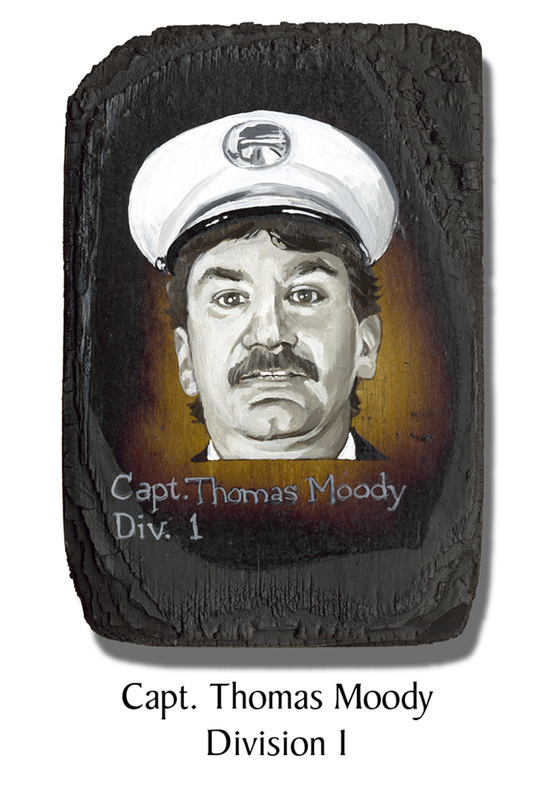 This entry was posted in Better Angels Stories and tagged 343, 9/11, better angels, Dawn Siebel, FDNY, firefighter, firefighters, firefighters of 9/11, Haz-Mat 1, LODD, Manhattan, memorial, NFFF, paintings, portraits, Thomas Moody, World Trade Center, WTC. Bookmark the permalink.